Posts categorized "02 Marble Run and Construction Toy"
Hanukkah Bush, Christmas Tree, Blue Spruce and Marble Maze! This blue spruce sapling with snow-tipped branches is just in time for the Holidays. Build this with two Q-BA-MAZE Cool Colors 50-packs following the marble maze plan here. This is a design by one of several University of Minnesota interns working at Q-BA-MAZE. She sees a face. I see a Balinese temple. Since it is a pretty abstract design, we have named it Tower Eleven. It is made from one Big Box or both the Warm and Cool Starter Sets combined. To build it yourself, see this construction plan. 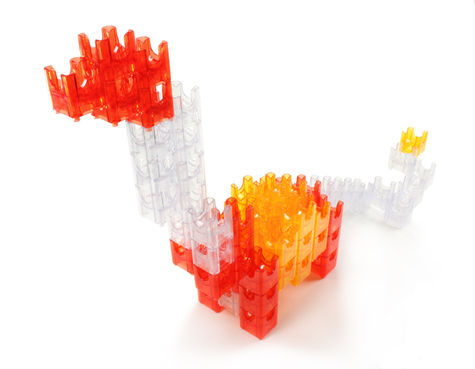 This Q-BA-MAZE sculpture uses all of the cubes of a Cool Starter Set. Designing a representational sculpture like this Flower in which each cube is used with consideration of color, pathway, and stability is a fun challenge. Here is the Fish Eight marble run sculpture! It is made with one Big Box or both the Warm and Cool Starter Sets combined. The construction plan for Fish Eight is on the Q-BA-MAZE marble run plans page. DINO ONE is our first dinosaur marble run design and we are about to follow this up with ROBOT ONE and BUTTERFLY ONE, TWO, THREE, and FOUR. You can find instruction plans for DINO ONE on our ever-growing plans page on the Q-BA-MAZE website. The plans page includes Q-BA-MAZE designs you can build using anywhere from 12 to more than 100 cubes.